I wrote this because I see a lot of people struggling with finishing their airplanes and I don't see anything well written on the subject anywhere. I have seen a number of articles in magazines and books but they all seem to be written by people who are writers rather then builders and never actually did the job, let alone would be good at it. The latest example of such article is in Sport Aviation 2/2003 named The Joy of Sanding, four pages filled but nothing helpful about how to do the job. I, on the other hand, am no writer and English is a second language for me to top it off, so bear with me. My own experience comes from building composite tools and production parts for kit airplanes as a business and from doing all the finish work on an award winning Lancair IV P for Mike Shooner under the command of Arthur Gallant who himself received Oshkosh Grand Champion for his Lancair 320. I learned a lot on that project. The following describes in great details the techniques I use to obtain a perfect straight wave free airfoil shape on wings and the fuselage, and do it with the minimum effort and cost without spending years on it (or so I think). The process goes basically in two stages, first, we shape/contour the surface, second, we perfect the surface for the paint application. In other articles you probably read directions about looking for "The Low Spots" with all kinds of tricks on how to identify them and fill them, then sand, then recheck and refill again and again and again. This is the wrong way to do it. Not only is this technique time consuming, achieving a wave free surface by a patchwork of fillings is just about impossible. 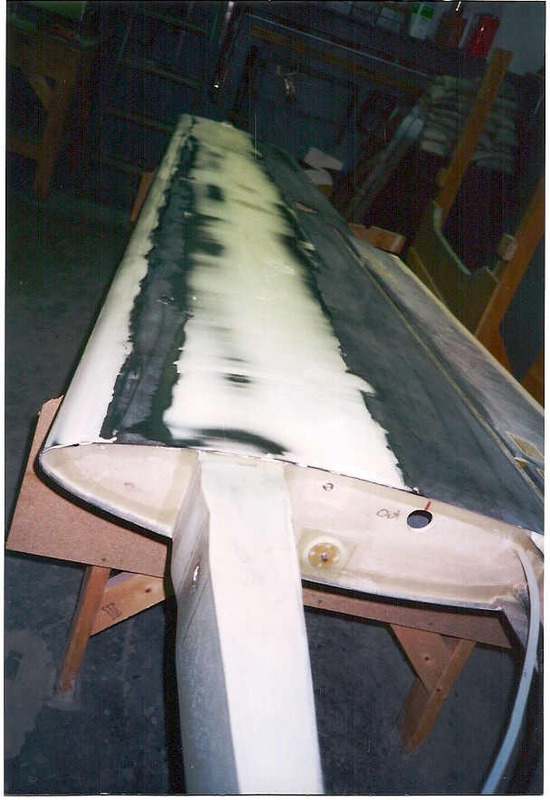 The right way to do it is to fill all of the surface (meaning like one side of a wing or a fuselage) at once with a coat of filler sufficiently thick enough to fully fill all the lows, then sand the whole surface as one uniform plain ONCE, without the need of refilling again. The amount of filler to sand off may seem overwhelming at first but the use of proper sanding technique described later on makes this task rather effortless. Using this technique you never look for low spots, instead you keep sanding until the highs start coming up through the filler. Some airplanes, because of their building process will have deep depressions, like in the place of spars or joints, which would be difficult to fill sufficiently deep and yet smooth in one fill. The builders natural tendency would be just to do the first big fill, sand to the shape and then refill the areas of these low depressions as needed. It needs to be done the other way around, you need to fill these deep depression first, however that first fill must still stay below the intended finished surface height, sanding through the top fill into the first filler coat would create hard spots and uneven sanding properties. The picture below shows a good example of this first head start fill where we had a significant depression in the skin in the spar area and the joggle joint on the leading edge. I strongly recommend spraying a light coat of black primer, before you start filling, Even thou this step is not absolutely necessary it is very helpful in guiding where to direct more sanding and when to change to finer sandpaper grade. The filler becomes translucent as it gets thinner and the black color starts showing through as dark spots indicating you are getting close to the skin surface. The filler is a plain mix of epoxy and glass micro balloons, commonly called "micro". It's not all that easy to work with but it's the lightest filler there is with good strength and stability after its cured. I would not say you can not use one of the ready to apply premixed epoxy fillers like SuperFil but be aware that despite all the advertising hype this filler is about twice as heavy as home made micro and it will cost a lot more as a number of gallons of filler are used. The epoxy resin used to mix micro must be one of the low viscosity types that will allow high ratio of microbaloons to be mixed in. I have used Aeropoxy and Jeffco which both work well. I mix it in a large salad bowl about 2/3 to 3/4 of a gallon at a time which is about as much as I can handle. Mixing is done with a classic flat paint mixing stick and in a slow motion, trying to mix it fast will not get the job done any sooner, you will only blow half of the microbaloons in to the air. The finished mix must be fairly dry, keep adding microbaloons until it becomes difficult to mix. As long as the mix is visibly flowing and leveling by itself its still too wet, another indicator the mix still needs more microbaloons is that the surface turns glossy when you let it sit a minute that�s the extra epoxy migrating to the surface. Properly mixed micro spreads with moderate difficulty and fairly high amount of pressure is required. If it spreads easily it's too wet. Be aware that micro has one distinct characteristic, that is, the two materials - microbaloons and epoxy tend to separate from one another when still. This characteristic is good for the fact that the resin migrates onto the surface being filled creating a real good bond to it. The bad part is if you have to refill an area, the resin migrates into the surface of the previously applied micro creating hard spots when sanding it. These hard spots create raised areas, a real pain to deal with so try to avoid that. Some people squeegee pure resin on the surface to wet it out just prior applying the micro. I see no reason or purpose of that, I think they got it from the way the plaster skim coat is applied on the drywall. To apply the micro to the surface, use a 6-inch metal trowel. Blob all the micro (the mixed batch) to the middle of the surface and then trowel it in the direction toward yourself first to one edge, then run around and to the other side edge. Always go in the direction of the curve. The trowel is run very flat to the surface and good pressure, you hold it by both hands by the top part of the blade with all fingers on top and thumbs in the bottom the get a good grip, bend the handle up about 30 degrees to get it out of the way. The low angle and plenty of pressure are important because that is what pushes the air bubbles that got mixed in to the micro out of the micro. You will notice that at first it doesn't seem to want to stick and wants to roll off, but then when the surface starts to get wetted out, it goes on pretty smooth. You don't have much time thou, if you fuss with it too long or try to redo an area you did a few minutes ago, it will start to tear up, lift off and break up. This is because o lot of resin migrated onto the surface and the micro starts to slide on it and unstuck from the surface easily, remember this important tip, if you make a pass and you see the micro breaking up make a pass in the opposite direction, that will smooth it right up, but then just stop fussing with it. The thickness if the coat should be somewhere between 1/8 to � of an inch, you shouldn't have any lows on your surface deeper then 1/8 of an inch .A little bit too much is better then a little bit not enough because it's still easier to sand off some extra then having to refill again. It takes some practice, if you want to see how thick it is , just dip a Popsicle stick in to it. As a general rule, start the filling on smaller, single curve surfaces like the tail, then large single curve surfaces like wings, and last the most difficult compound curved parts on the fuselage, engine cowl, wing fillet so that the level of difficulty goes up along with your filling and sanding learning curve. On filling the compound shapes the flat metal trowel will not work, for those you need to use a flexible plastic squeegee. With 4 fingers on top and the thumb against the bottom you can "cap" the squeegee so it follows the curve. Home depot sells nice ones in a tri pack of 5, 4 and 2.5 inch wide. On a part like a fuselage where you will not be able to fill the whole surface at once, try to divide it so bring the edges to a break like a corner where blending of one fill into another is easiest. If the fuselage is oval, do the break where the curve is the sharpest, its much easier to blend it there then on the shallow curve. It should take about 2 hours to fill one wing panel on a small two-seater, up to about 4 hours on a big four-seater. There are three aspects of the sanding technique that will enable you to arrive to that perfect straight wave free surface. First, you must use the right size an shape sanding tool for a given job, different shapes require different tool, boards, blocks, tubes, long and short as needed, Many builders don't realize (or disregard) the importance of the right sanding tools. Trying to sand with a chunk of triple folded sandpaper pushed along with bear hand is not going to work too well. You will find it a great paradox if you visit somebody's workshop who claims spending hundreds of hours on finish sanding his airplane and yet you won't be able to find a decent sanding board in his shop. Make yourself two basic sanding boards 2,3/4 inch wide 16 and 32 inches long, for the length of one and two strips of sandpaper. I think the best is to use that white shelving material. You need to attach an 1 � x 1 � aluminum square tube or a "C" channel to the back side of it with some screws, that will keep it straight and also gives you a good grip so you can hold on to it. The 32 inch one will be used on the wings, 16 inch on the tail, control surfaces and flat parts of the fuselage. For compound surfaces you will need to make flexible sanding boards. Not many people know this as I have never seen it mentioned anywhere but it will make you work a lot easier when the sanding board bends under the pressure and follows the curve of the surface. You will need two boards, one should flex rather easy for highly curved surfaces and one should be fairly stiff for mild curves. The 16 inches length of these flexible boards should be enough . Use thin plywood, Plexiglas, or whatever works for you. Get the real sandpaper from auto paint supply store, the one that comes in 16 inch long strips, they usually carry the best, the 3M brand is pretty sure bet. The sandpaper grades needed are 36, 80 and 100. Glue it on with 3M Super 77 spray adhesive (Home depot), spray on only a light coat of it, that stuff sticks like hell. To remove the worn out paper, heat it up with a heat gun, it will peel right off. On tube shape sanding tools the strips will not work, for those, get the big sheets for floor sanding from Home depot. The second aspects of the sanding technique is the proper sanding pattern. 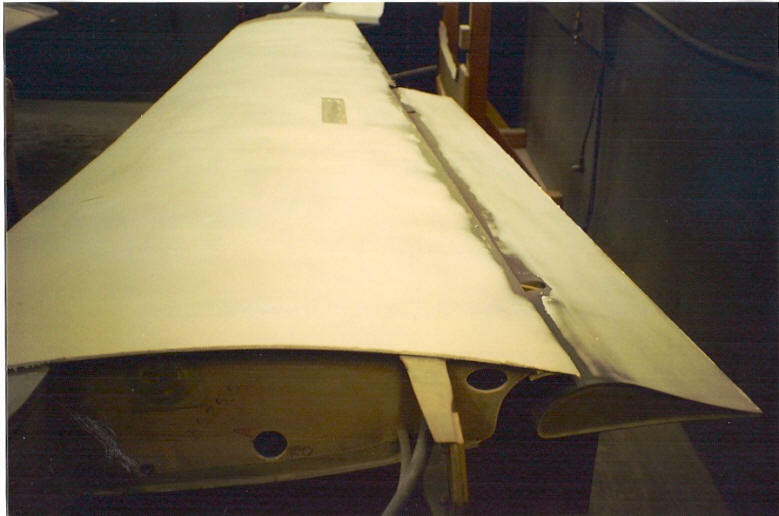 For an airfoil shape surface, hold the sanding board parallel (at all times) to the span and sand at 45 degrees angle, use the longest (reasonable) stroke, across the whole cord if possible. Start at the root end leading edge side and move slowly to the tip end with each stroke moved about an inch or two, creating a sort of a tall tight zigzag pattern. When you get to the tip, go back to the root and start another pass, this time sanding at 45 degrees the other way - 90 degrees to the first pass. After these two passes move yourself to the trailing edge side and make two passes from there, again starting the first pass at 90 degrees to the previous one, and then keep repeating this cycle. It is this sanding pattern, that will level out the highs and lows into a nice even flowing plain and create the desired wave free surface. Here the left wing is sanded and the right wing is just getting started. It�s hard to take a picture of an all white surface, it tends to get overexposed and the details are lost but looking at the pattern of the dark spots will give you pretty good idea what it should look like. This is the horizontal stabilizer just at the point when the shaping is done and when I switch to finer grade paper. You can see the cross hatch sanding pattern there. The dark spots will get quite a bit darker by the time all deep scratches are gone. 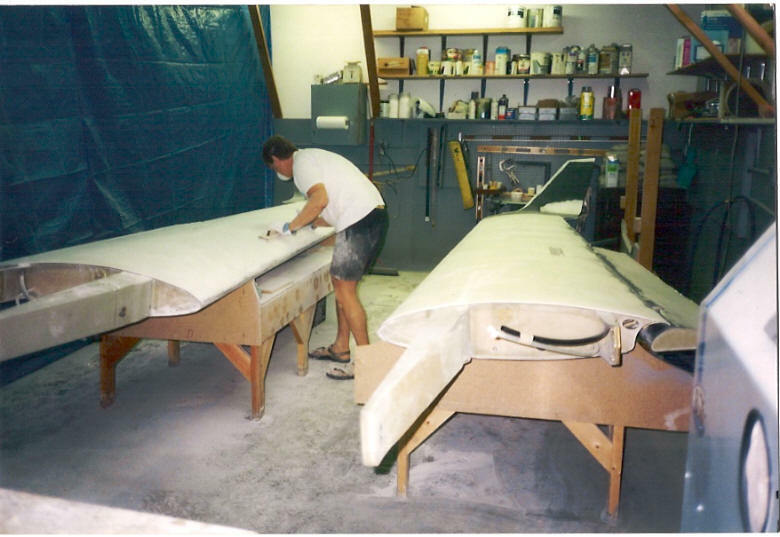 It should take about 4 hours to sand one wing panel to shape on a small two-seater, up to about 8 hours on a big four-seater. Compound curved surfaces are a little harder to do. Keep basically the same crisscross 45 degree pattern relative to the direction of the milder curve with your flexible sanding board, but pay a lot more attention to "feeling" the surface and sanding off the highs. By the time you do all your flying surfaces you will be pretty good at it. There are three kinds of details we have on the plane to deal with, fillets where components come together and meet at different angles, fitting of access and inspection panels and uniform control surfaces gaps. 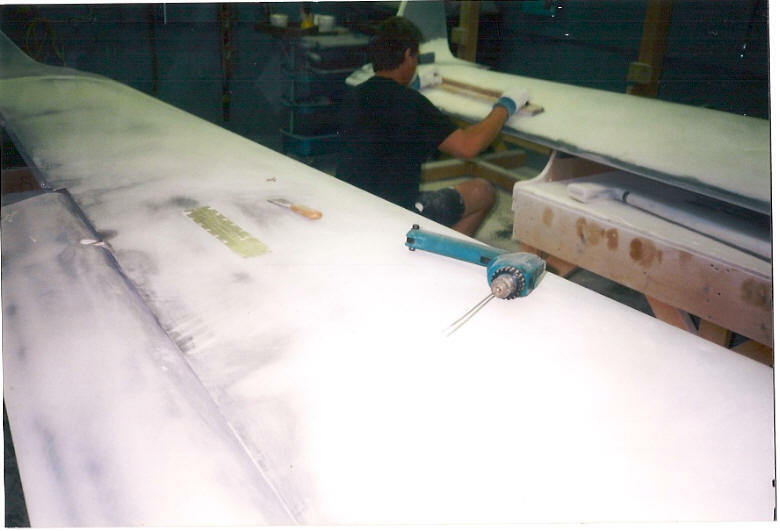 Take a note here, if you decide to do the control surfaces gaps, you need to do them Before the general surface filling of the control surfaces, that way the filler is brought up to and blended to the level required to close the gaps at the nose area of that control surface. Filets are fairly easy, shape a corner of a plastic squeegee to the desired radius and use that to shape the applied micro into the fillet radius . Run the squeegee back and forth in alternating directions very flat at first to evenly distribute the micro, then start standing it up with each pass to gradually remove the excess micro and arrive to the final radius. Use the tube sanding tool that closely matches the radius to sand it smooth. Inspection panels . In order to have good looking access and inspection panels, or any other openings like gear doors and baggage compartments doors or even an engine cowling if its fitted flush with the fuselage, you need to create a small even gap around them. Here is the trick how to do that. Fist make sure the covers are exact size and shape, round off the corners, square corners don�t look right. Apply clear package sealing tape to the backside and wherever needed as a release and mount the covers into exact position. Now squeegee the micro all around the recess, or over the whole cover if the height of it is not even, and then run a mixing stick all around the cover tight against the edge to create a nice line around it. Cutting down the width of the mixing stick will help it to go around the corners without widening the gap and dipping the mixing stick in lacquer thinner will prevent micro from sticking to the stick and help to keep the line edges nice and smooth. Control surfaces gaps Ever heard about those incredible even Quarter thickness gaps that don�t change a bit, even when you move the surface ? Here is how to make them. 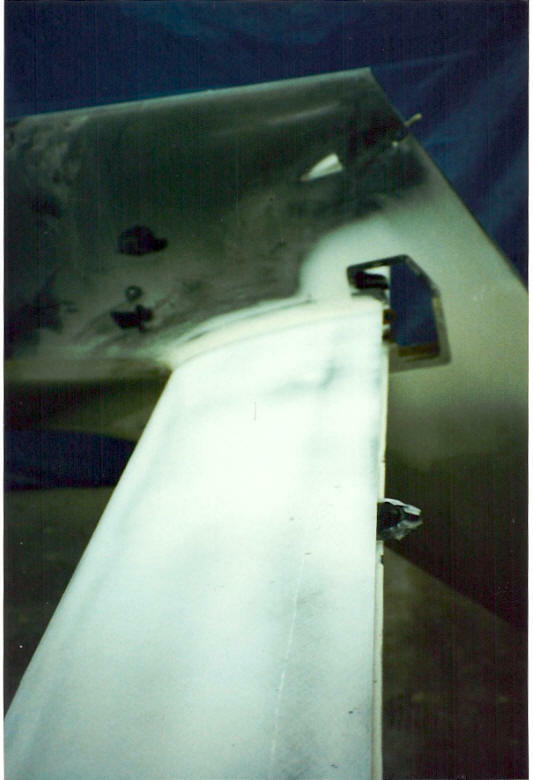 Apply several plies of duck tape on the underside of the trailing edge to build up the desired gap thickness. Put clear packaging tape over it (its slicker and slides better), you will probably be able to handle only one side at the time. Apply plenty of micro to the nose of the control surface to fill the intended gap and then some. Cover the micro with a plastic sheet, using thicker stiffer kind on this works better, install the control surface into its hinges and slowly move it up and down through the whole travel so that the excess micro is pushed out. Viola, after the duck tape build up is removed, you have a beautiful small and even gap through the whole control surface travel. Before you start removing the excess micro that got pushed off mark the ends of the travel with a good line as reference so you don�t lose it and sand into it later. before filling the rest of the surface, cover the finished gap part with the duck tape to preserve it. This concludes the first stage, the surface shaping. is the second stage of the work when we remove all the nicks, pits, tears and finally the scratches. First, vacuum the surface, you need to get all the sanding dust out of the nicks so you can see them and fill them. Micro does not work on small nicks, it has too coarse consistency. You can use the Superfil which is much smoother or you can mix your own filler by adding cab-o-sil along with microbaloons. To mix this filler, get a coffee can, fill it 1/3 with microbaloons first, then 1/3 Cab-o-sil. Leave the last third empty so you can mix it well and add more of either substance if you want to adjust the ratio, throw some wood blocks in to help mixing it, put the lid on and mix it well. Fill the nicks with a small one inch metal spatula. Squeegee the filler on to fill the nick but scrape all the excess from the surface, it would be very hard to sand. That way you will do only light sanding over those spots to remove the leftover fuzz. To get the right perspective what size of the nicks is big enough to fill and which is too small to be bothered with, use the rule, if you can see it from two feet away, fill it. Another way to look at it if the nick is no deeper then a scratch left by a 36 grid sandpaper. These are tiny voids, bubbles and pits caused by air mixed into the filler. They are invisible until the minute you start spraying the first coat of primer. They can give you a big headache if you attack them the wrong way. You might have heard horror stories of builders spraying coat after coat of primer trying to get rid of them. The bottom line is, you cannot fill the pinholes by spraying. Yes, if you keep spraying long enough, eventually they will disappear, but they will not be filled, they will be bridged. Bridged pinholes can cause the painted surface to develop little pimple like bumps on the sun when the paint softens some and the trapped air expands with the heat. Luckily, we have a simple effective way how to deal with pinholes before we even see any. Vacuum the surface real well to remove any dust and then squeegee pure epoxy resin over the surface. The coat is very thin and the amount of resin is mall, you are basically just wetting the surface, give it some time to soak in and squeegee off all the excess. The resin has very low surface tension so it flows into all those small voids and because unlike primers it doesn�t contain any volatiles it doesn�t shrink as it cures so the fill is complete. The second benefit of this step is that the resins hardens the top shell of the micro, making it more durable. A word of caution, many epoxy resins do not cure well and stay gummy at very thin coat, especially in humid condition. If yours is one of those or you are not sure, use the West system epoxy for this. When this top coat is cured sand it lightly with 100 just to break the gloss, and you are ready for the primer. The primer used in this step is a "high build up" kind, intended for final wet sanding. There are many on the market so I can�t say you must use this , or cannot use that, except maybe for one. You may have seen reference in other articles (especially the older ones) to use "Feather fill". I have used it and I don�t understand how anybody can recommend it . This is one of the worst products I have seen in my life. I have been using two kinds of primers so far. One is "PPG K200" this is acrylic urethane (two part 4:1), very fast drying, easy to spray, dark yellow in color. Available from auto paint supply stores. It wet sands very easy, however it has rather soft properties even when cured. Mishandling of parts can dent and scratch the surface rather easily. The other kind is epoxy based "US Paint D9002 base /D3002 converter" (Two part 1:1). Also dark yellow, available from marine supply stores ( www.uspaint.com ) This primer takes longer to dry and it�s a bit harder to sand but it is very hard and durable when fully cured. I myself prefer the better durability, even if it takes more work. I have not had a chance to try "Poly-fiber Smooth Prime" but I plan on it. Wet sanding is done by still keeping the same 45 degrees crisscross pattern but the sanding blocks are a lot smaller, 11x3 inches for large parts 5.5x3 for the smaller ones. I use pieces of hard foam as sanding blocks. Use the same "super 77 spray adhesive" and spray just very light mist on it to attach it, it will peel off without the need of heating it up. Start with 180 grade for fast progress but be aware 180 leaves pretty deep scratches that would show in the paint so switch to 220 grade for the second half of the job. On the contrary to some peoples believe, 1 sheet of wet sandpaper does not last forever, it just isn�t as obvious its getting dull by looking at it so change the paper often. To check the progression and quality of the surface use the squeegee technique. Pour some water over the surface and squeegee it off with a rubber window squeegee (Home depot has those), all the remaining pits will become instantly visible. Keep sanding and checking until they are all gone. Don�t go crazy if you have a few deeper nicks left here and there, and don�t sand flat spots or dips into your surface in order to get rid of them. They will be filled instead. For this last filling use polyester based "glazing putty" (auto paint supplies) This is very smooth creamy filler designed for minor imperfections. Before you start filling go over the whole surface carefully and mark all imperfections to be filled with a pencil so you don�t have too look for them while your mixed putty is curing. Mix the glazing filler in small batches, it has very short pot life so you have only a few minutes on each batch. Squeegee it on with a small metal spatula and scrape off any excess. Wet sand the spots after they cure and you are done. There will be one more coat of primer but that is as a part of painting . Every paint system normally has its own primer that goes on just before the paint to insure good paint adhesion. This is where I leave it, I�m not an expert on painting so with the paint you are on your own. This is only one mans opinion and my contradict with experience and advice of others. You can distribute and link to this page freely, comments and questions are welcomed.